(SPOILERS) The original anime isn’t exactly the most emotionally enriched of movies. Its themes are rather of the cool, cerebral variety, particularly so with its characters’ didactic (some might say long-winded) conversations and exposition. 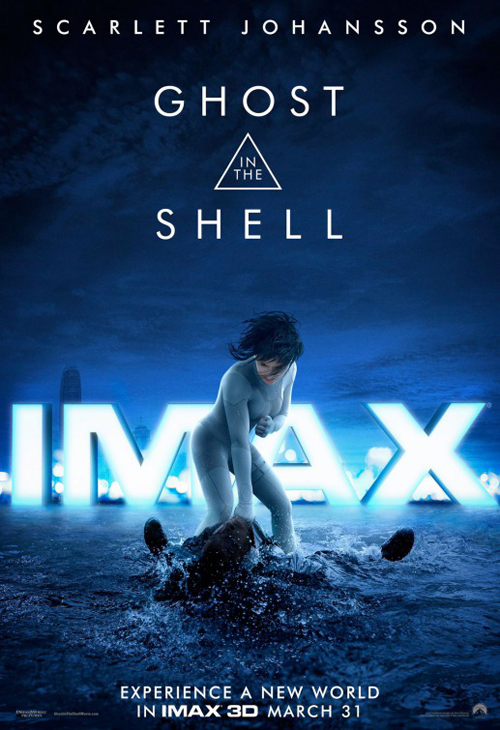 As such, you might have expected the Ghost in the Shell remake, expressly repositioning itself as a hero(ine) narrative of self-discovery and realisation, to chart its own distinctive trajectory, perhaps even sufficiently to succeed on its own terms. It's failure, in part, is likely because this change in direction is suggestive of committee decision making, rather than dictated by someone with a strong idea. 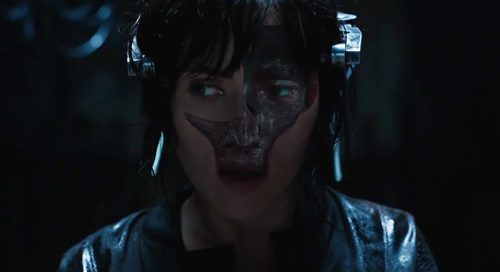 And make no mistake, Ghost in the Shell is entirely absent its own strong idea or direction. It has plenty of ideas and decent direction (from Rupert Sanders, although most impressive – sort of backhanded, really – is how he precisely replicates shots from the anime, that and how he replicates action from the Wachowskis’ Matrix trilogy, who were, in turn, hugely influence by the anime), but they’re all second or third hand by this point. This movie’s prime window was probably 2000 at the latest, rather than eventually crawling to the screen after a decade of development hell (perhaps surprisingly, it was only snapped up by DreamWorks in 2008, a sign that Spielberg isn’t as sharp as he once was, either that or he just takes a vacuum cleaner to potential properties). Perhaps the only positive to come of this is that it ought to put the kibosh on Warner Bros’ Akira – which has been gestating since 2002 – getting made. I’m possibly being unnecessarily harsh. I didn’t dislike Ghost in the Shell. Moment to moment and scene to scene there were aspects that kept my attention, and fitfully it stirs itself with a flourish, but I was uninvested in either plot of character, and pretty visuals – pretty, derivative visuals – can provide only so much compensation. The screenplay, refashioned from the original, with a splattering of elements from the Mangas, by Jamie Moss (Street Kings), William Wheeler (the actually pretty good The Hoax, about Clifford Irving faking Howard Hughes’ autobiography) and Ehren Kruger (who counters three Transformers among his litany of achievements), ditches the AI Puppet Master and the wheels of conspiracy within government agencies, and instead comes up with a decidedly more mundane evil corporation (headed up by the rather dull Peter Ferdinando; it would have been much more fun to have Michael Wincott in the role, exercising his well-established villain chops – alas, he’s iced in the first scene; poor old Tricky doesn’t even make it that far, his monk was deleted). On top of which, this is that most rote of Hollywood staples: an origins story. The anime neglects to reveal where the Major comes from, and she isn’t on a quest to find out. Like Alex Murphy/Robocop, she’s the first (successful) of her kind (the comics’ Motoko character may have been, or at least one of the first, but there’s no reference to this in the anime itself). So the plot revolves around the protagonist, invested with fake memories, finding out who she is, to the closure point where she is reunited with her mother (Kaori Momoi). The more abstracted philosophising about the nature of humanity that came with the original is thus surrendered for yet another movie about family (another current Hollywood fave), reinforced by replacing the AI with by Michael Pitt’s Hideo Kuze (a character outside of the 1995 film) – even the merging aspect is apparently neglected (Kuze’s offer doesn’t appear to be taken up, although that might have been addressed in a sequel). This wouldn’t necessarily have been a problem if Sanders had taken the bit between his teeth and explored where this left Major Mira Killian, but he doesn’t. The character is only ever a void, and neither the screenplay nor Scarlett Johansson are able to convey an inner life or process. There’s no journey here – to use Murphy in Robocop as an example again, particularly as both pictures end with the main character apparently accepting their law enforcement fate – aside from a Kate Perry moment and brief bonding with animals. Sanders must definitely cop the blame for at least some of this – he’s so intent on fashioning the visuals that he fails to come to grips with theme and tone. Sure, I was wowed by his replication of shots, from the hover copters to the pursuit of a suspect down a street, of the diligence to design (from the spider hands, to the appearance of Pilou Asbæk’s Batou, to Mira’s body buckling under the strain of tearing apart the tank), but it’s all on a hiding to nothing if you don’t care about what’s going on. It’s also a problem of casting. I’m not, as I’m wont to mention whenever she shows up in something, the greatest fan of ScarJo, although I’ll hasten to admit when she suits a part (Under the Skin, Her). Here, Margot Robbie, who dropped out to make Suicide Squad (probably a take your pick qualitatively, but definitely the better choice in terms of bank balance) would surely have been better than blank Scarlett. And I don’t mean blank to compliment her insightful performance as a confused cyborg, rather to describe the lack of energy at the centre of the picture. Sure, she fills out a flesh-coloured body stocking, but that’s about all. Admittedly, she’s mastered some slightly robotic movements, but she moderates these with the same slightly witless expression she employs for all her roles. 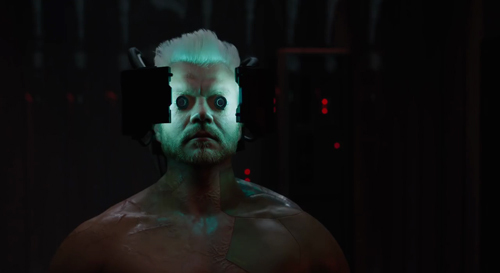 In contrast, Asbæk is note-perfect as Batou; he understands the level at which this should be played in a way no one else – not the star, not the director – does. 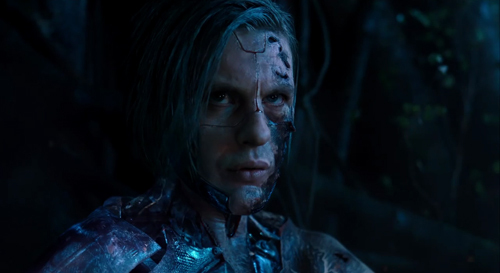 Michael Carmen Sandiego Pitt, as he’s now apparently known, is fine, I guess, although the potential for the character, particular given the early portents, is rather diminished by his generic, sub-Terminator/ Cyborg/ Frankenstein’s monster look. Juliette Binoche gives some substance to a clichéd guilty scientist, required to atone for putting ethics on the backburner, while Takeshi Kitano, quite rightly speaking subtitled Japanese (of all the elements here, this is one that entirely fits, however much it may have been a matter of practicality) scores in a nice little scene where he uses a brief case as a shield during a shootout. Of course, the biggest conversation to have resulted from a largely-ignored movie thus far (it remains to be seen if it will be shunned by Asian audiences; Paramount will be praying not, but the press is acting like its done and dusted), is the accusation of whitewashing. It would be a rather tiresome subject – really, what did anyone expect, it’s a Hollywood studio with its eye on demographics, they were never going to serve the source material in that regard, unless they could guarantee Rinko Kikuchi would put bums on seats globally – if not for the foot-in-mouth manner in which the studio has invited further criticism. Starting with reports of tests to turn Scarlett Japanese – I don’t think so; the only time that worked was with Sean’s amazing transformation in You Only Live Twice – then the “I am Major” meme generator that backfired disastrously – typically, respondents offered photos of Asian actresses with comments along the lines of “I am the woman that should’ve been cast” and, most pointedly, and amusingly, “I am the face of Asians in Hollywood” showing Mickey Rooney in Breakfast at Tiffany’s – and now with movie’s revelation that Mira is in fact Motoko Kusanagi (the anime/Manga character) in a western shell, they’ve not so much stepped as fallen flat on their faces into a great steaming pile. I can quite believe, in their own blinkered way, that the makers thought Mira’s true identity was some sort of ameliorating, inclusive gesture (and certainly, it’s one that at least makes sense narratively), but it comes across as simply rubbing salt in the wound. I’m not overly exercised by the issue, particularly since there’s almost always a blue touch paper aspect to inflaming these kinds of media firestorms (as Oshii said, not quite Jim Cameron giving his blessing to Terminator Genisys, “I can only sense a political motive from the people opposing it, and I believe artistic expression must be free from politics”; I trust he was paid handsomely for his quote); I’d probably be more inclined to defend the choice if the picture as a whole had risen to the potential of its source material. Sanders handles the action sequences entirely competently and knows how to integrate his special effects (as Snow White and the Huntsman also evidenced), but he displays little evidence for having a grasp on basic storytelling. The visuals are frequently fantastic but mostly familiar. Occasionally, something stands out (Mira being dragged into a mire of grabbing hands when she dives into the geisha’s AI; of which, the spider geisha is tremendous), but too much of the movie is reliant on sumptuous art direction. The music, from Clint Mansell and Lorne Balfe is solid, but the anime’s superlative Utai IV: Reawakening by Kenji Kawai, played over the end credits, highlights just how lacking in its own distinctive personality the picture is. Does that explain audiences’ lack of appetite? The post-mortems on bombs are invariably “I told you sos” that clutch at straws. Poor reviews are only cited as a factor when something bombs, not when it’s a hit. The whitewashing controversy is important to just about no one, in terms of a general audience actually caring about seeing a movie or not. Citing a star’s failing status is only significant until the next hit (somehow Lucy evidently managed to whet appetites in a way this plain didn’t). I suspect – since it was my first reaction on seeing the trailer – that it’s mostly that this looks like a movie transported from 20 years ago, so indebted is it for ideas and visuals to The Matrix and the preceding Ghost in the Machine (which has filtered into so much else, as well as itself being influenced by Blade Runner). But you never can tell what will hit the spot, and it would only take Sander’s movie to have the kind of reception in Asian markets as Pacific Rim (let alone Warcraft) for the takeaway to be more forgiving. Which leads to the consideration that perhaps it would have done better with Rinko. The not-especially-original conclusion of many a review has been that this is a shell lacking a ghost, and it’s unfortunately apposite. I mentioned Elon Musk and his transhumanist vision in my review of the original, but the remake is so functional in approach, this aspect barely merits mention. Failing to translate ideas isn’t necessarily the worst offence, not if a picture has sufficient momentum and proves a decent ride. Sadly, while Sanders can put an action sequence together with aplomb, its what’s in between that stuffs up Ghost in the Shell. There’s nothing propelling the plot, no kineticism. It’s nice to look at, but that isn’t enough.